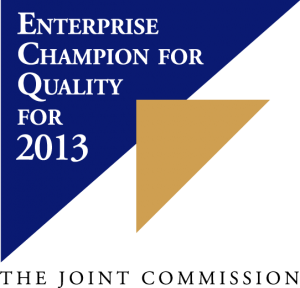 BrightStar Care® has received The Joint Commission’s Enterprise Champion for Quality award for 2013. The Joint Commission, a nationally recognized healthcare quality standards organization that also accredits hospitals and other health care systems, acknowledged BrightStar Care’s efforts to promote high quality health care services by its franchises through Joint Commission accreditation. The prestigious distinction is awarded to select franchisor organizations with a proven commitment to the highest level of quality and safety, and further sets BrightStar Care apart as a quality-focused care provider. BrightStar Care is one of the charter recipients of this award and the largest national home care franchise to achieve this distinction. To keep in-home healthcare agencies performing to the highest possible standards, The Enterprise Champion for Quality award carries unique eligibility requirements. For example, in order to receive the award, the franchisor must demonstrate that at least 95 percent of their eligible franchises are accredited and in good standing. “With more than 250 BrightStar Care locations, this was a significant undertaking and represents a deep and abiding commitment to quality care at the highest level within our organization,” remarked Sharon Roth Maguire, MS, RN, GNP-BC, Chief Clinical Quality Officer for BrightStar Care. According to Roth Maguire, “The Enterprise Champion for Quality award further validates BrightStar Care’s strong commitment to upholding the highest standards of care for clients. In today’s highly competitive market of care providers, families should have an objective point of reference to help them choose the best agency to care for their loved ones. To meet the stringent requirements of The Joint Commission, BrightStar Care created systems to ensure continuity of care across its franchise system. For example, the franchisor creates templates of policies and procedures, integrates The Joint Commission’s standards into training materials and conducts regular “mock evaluations” to help franchisees uphold standards. BrightStar Care also provides seminars, conference calls and additional resources to franchise owners throughout the year to help them remain compliant with the standards. Learn more about Joint Commission accreditation. Or, for help with a loved one, click here to contact our care coordinators 24/7 or find a location near you.